Fleur de Sel Sea Salt for sale. Buy online at Zingerman's Mail Order. Gourmet Gifts. Food Gifts. Because I use it sparingly, I was shocked to find that there could be so much going on in something as seemingly simple as salt. When I tasted fleur de sel for the first time, it introduced me to an entirely new and inviting world of flavors. Looking like newly fallen wet snowflakes, this salt collects naturally along the coast of Brittany and is hand gathered like wildflowers "growing" on the sea. 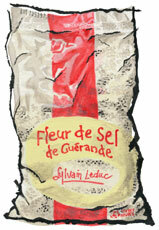 Fleur de sel has an aroma that hints of freshly picked violets (hence the name "fleur") and a truly amazing flavor. The success of fleur de sel has revived the artisan salt trade on many coasts, including Portugal's Algarve, where it's known as flor de sal. This salt, from Brittany's Guérande, is the original, still revered for its complex flavors and snowflake-like texture. A revelation prized by the best bakers and chefs of France. With less sodium chloride and more magnesium, potassium and calcium, it salts more subtly than standard sea salt. Use it at the end of cooking, to delicately salt something just before you eat.